Sometimes birds have feathers that don't seem to follow any particular pattern, they almost have a shaggy look to them, like these feathers on a Kingfishers back or many of the feathers on Bee Eaters. They still need to look soft and well ..... feathery, but could easily look wiry and more like hair. 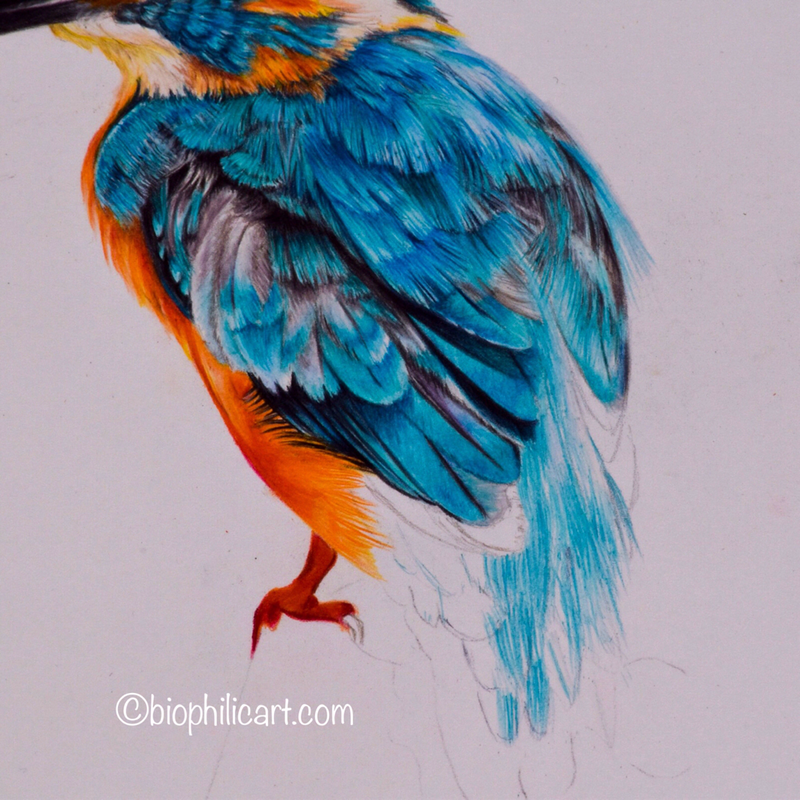 So l thought l would share how l worked these on my Kingfisher drawing. The first thing l had to do was really scrutinise my reference photo to try to see where there were lines between different sets of feathers. This actually isn't that easy and it is really worth taking your time at this point to look hard, you should start to see rough shapes. When l have got those shapes in my head l take a mid shade pencil and roughly mark them out on my piece. So you can see in the first picture l have roughly outlined them in a mid turquoise color. This is simply to give me a guide. Don't put too much pressure on the pencil at this point or mark in the shapes too solidly. You don't want these outlines to show through in the finished piece. After marking the outlines the next thing l do (also in the first photo, although not visible) is mark in the highlights in white. (I used Caran D'Ache Luminance for this). Use strokes the length of the feathers, still working as if you were marking a white feather. 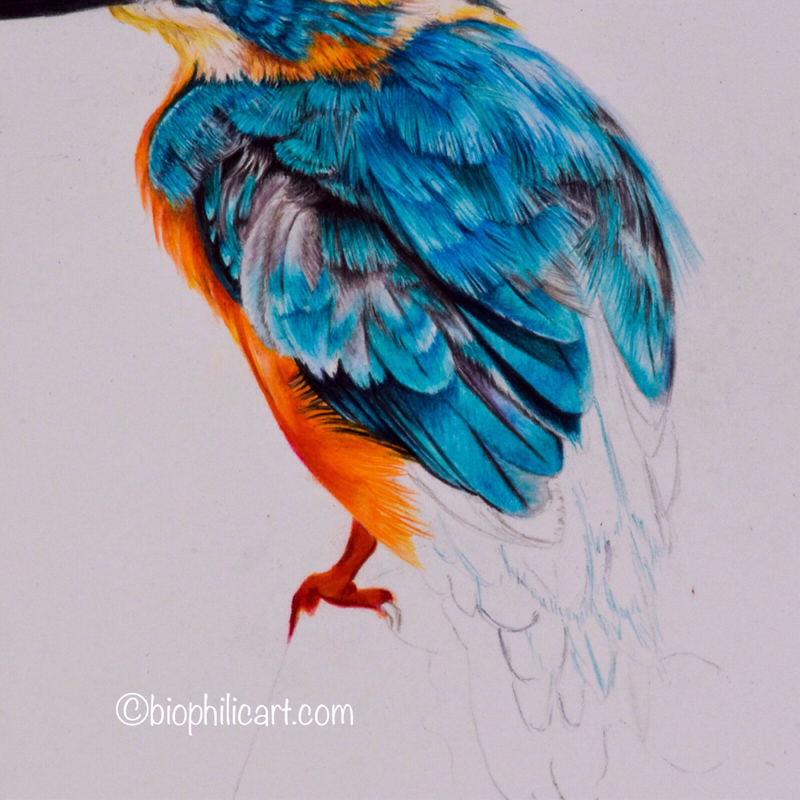 Although there are no white highlights in the finished feathers this white layer creates a resistance to the colours on top, helping to keep them light. 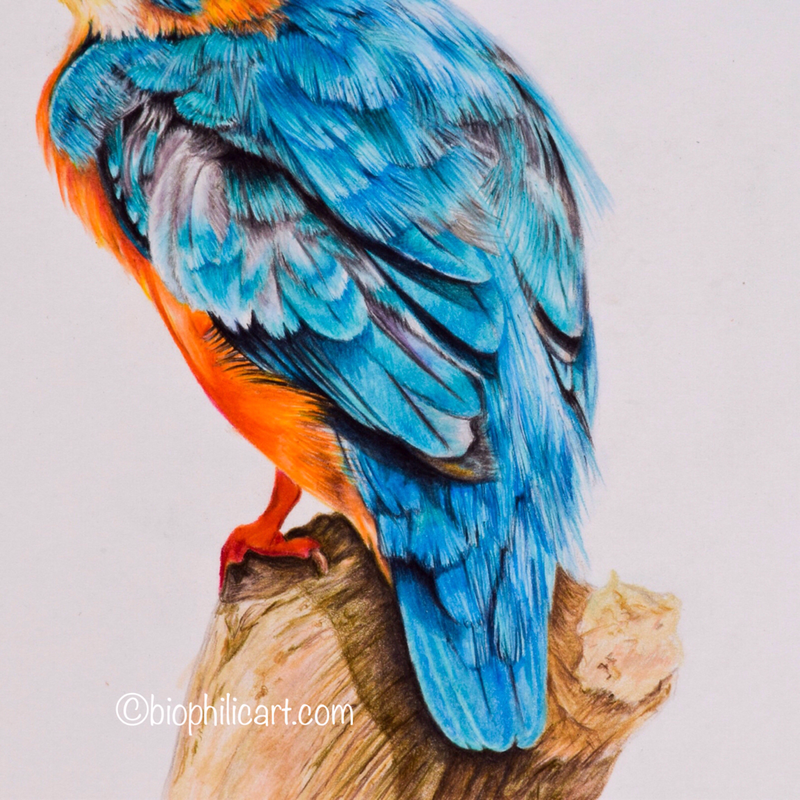 In the second photo l have taken a Prismacolor Sky Blue Light and worked strokes of the palest parts of the feather. 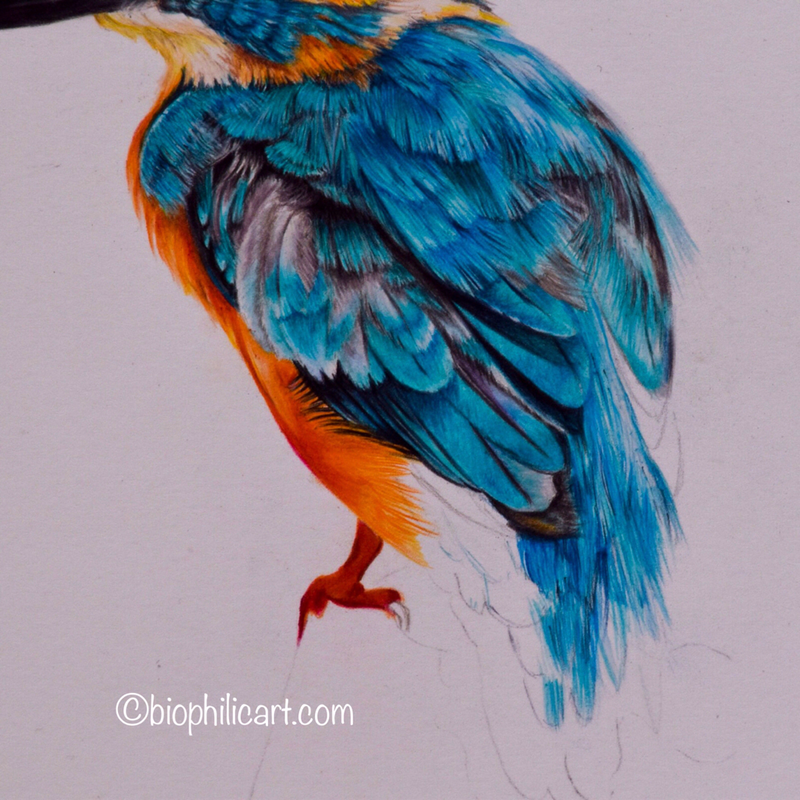 Then l have used Faber Castell Polychromos Cobalt Turquoise, Caran D'Ache Pablos Turquoise Green and Caran D'Ache Luminance Turquoise Blue to mark out the base layers for the feathers. All l am doing at this stage is marking the direction and length of each feather segment. I am looking carefully at the reference photo as l do this, to check that the directions are right and also to get the right colours. In the third photo l start bringing in more colors. Luminance in Light Blue, Polychromos in Cobalt Green and Bluish Turquoise and Pablos in Bluish Pale and Blue Jeans. Always keeping the strokes the length of the individual feathers. You can see that this begins to build depth. Using many different shades helps to give life to the feather. 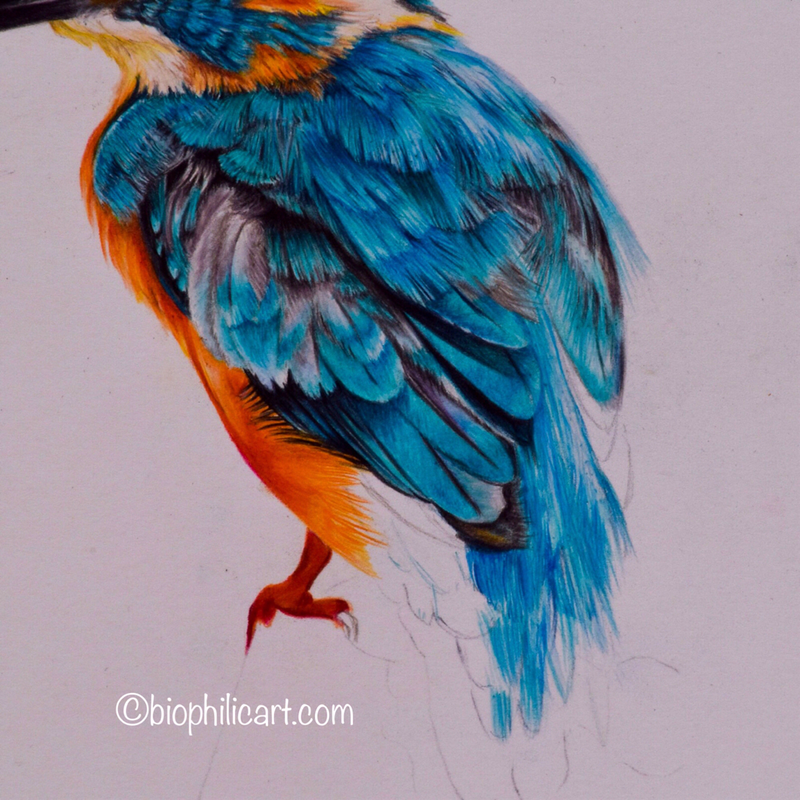 In the fourth photo l have used Polychromos Indigo and a Pablo white pencil to define the edges of groups of feathers and highlight some strands that lay on top. The white will not look bright white, but take on the colours beneath it and appear pale blue. Below is a shot from the finished piece.